Just the thought of a “Gluten Free Italy” convinced me that I needed a gluten filled Italy. Hence my absence from Curmudgeon.com for the last month. 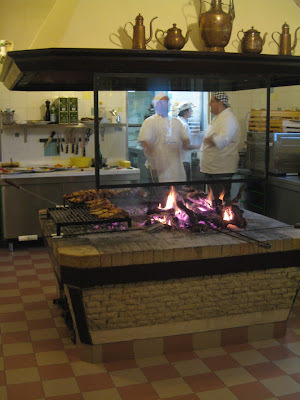 A while ago I came across a Google map of Northeastern Italy someone had made in 2008 of Slow Food’s Osterie (taverns) d'Italia, and I immediately started think about a road trip. Traditionally Italians have three categories of places to eat: Osterias--the simplest, Trattorias--still informal, and Ristoranti--formal. In actuality the categories are not so clearly defined anymore, and I think a more modern definition of Osterie would be "eatery" encompassing all three. While I don't think the limited addition of McDonalds and other fast food has changed anything, it sure has changed Italy as pointed out by some Italian friends. It has added a decent supply of easily accessible free public toilets. I preplanned a heavy eating trip, with one important meal a day, and a light sightseeing tour of Northern Italy. We met our friends in front of a car rental counter in Milan’s Malpensa airport. We had already been in Paris for 10 days, but they had just landed after about 20 hours with two plane changes. So I’d scheduled a light day of driving, and zero touring. I drove this leg and as I hadn’t driven stick shift in about 35 years managed to convince everyone in the car in about 5 minutes that I shouldn’t be the driver. Nonetheless, I did pretty well once we got on the autostada. One of our friends had never been to Italy (imagine that,) and the other had not been since before I had last driven stick shift. So our first stop was one on memory lane, for a light lunch snack at an Autogrill, many of which were built as classical mid-century futuristic restaurant bridges which span the highway. I had a plate of proscuitto and salami with a roll and a bottle of Pellagrino. It was sort of amazing when I think about truly nasty overpriced fast food you get at the food stops on The Garden State Parkway. Afterwards, we drove on to a "Locanda" (inn) which my wife and I had been to before. It was in the middle of nowhere, with no website or email address, in an area which is much too uninteresting to appear in guidebooks, but beautiful and peaceful nonetheless. When we arrived it was less than peaceful, it being Mother’s Day afternoon and everyone within many kilometers had taken their Nonna out to lunch at this place. There was exactly one space available, and waiting for our car in the unpaved parking lot shaded by chestnut and olive trees. Italian friends, with whom we had eaten at the inn once before had made the reservation by phone for us. We walked in, the open kitchen off to the right had a open wood grill as a center island with a huge hood over it to exhaust the wood and grilling smoke. I could see beef, veal, horse, chicken, and guinea fowl grilling. The aroma was incredible. Sadly we spoke no Italian, but it wasn't long before the staff figured out who we were, we got our rooms and our jet lagged friends crashed for a couple of hours. While they rested we unpacked and looked out a window down on a park like area with numerous Italian families standing around talking. My wife said she half expected them to break out in opening choruses of Cavalleria Rusticana. At that moment not speaking or understanding Italian wasn't so bad. The magic of the moment would have been ruined it if we had understood the everyday conversations below us. We went into a nearby town and sat down at a café and drank what everyone else was drinking: an Aperol Spritz. Aperol is a concoction made of bitter orange, gentian, rhubarb, and cinchona, and 11% alcohol according to Wikipedia. Don't bother asking because I have no idea what gentian and cinchona are. An Aperol Spritz which is slightly bitter like Camparri, adds ice, Prosecco, soda water, and a slice of orange, and it ends up less alcoholic than a glass of wine. While a bottle of Aperol sells for about $11 in any Italian supermarket it runs about $27 here in the U.S.A. (naturally.) It was served with potato chips and peanuts on the side. At every café we went to on this trip about three quarters of the people were having this florescent orange spritz. By the time we got back to the inn the parking lot was empty as all the nonnas, mothers, children and grandchildren had gone home. We had dinner on the large terrace of the inn, which was set under a canopy of chestnut trees overlooking the countryside. It was warm, and quite spectacular. But the dramatic countryside scenery was a minor thrill compared to the food. We started out with a large platter of Salumi, paper thin excellent cold cuts, salami, coppa, pancetta, proscuitto, and mortadella. The best of Italian traditional meat curing is so simple and straight forward, so unlike American with added sugars, artificial flavorings and chemicals, that it was hard to get enough of these melt on your tongue, palate pleasing, naturally moist and sweet cold cuts. The "antipasti" was followed by "primi", a bis, two pastas. The tortellini, for which the nearby town, Valeggio sul Minico, is famous, was served in a small amount of the pasta's boiling water and butter. The hand made egg pasta was very thin, about half as thick as the fresh tortellini you get in the U.S., and was filled with a delicious stuffing made from the local cured meats and others were filled with cheese. They made the tortellini one gets in America seem like they are created out of cardboard and filled with canned pet food. The other pasta was also a thin egg pasta rolled with very thin ham and served with butter and sage. It was hard to decide which I liked better, they were both so good. We followed the pasta absolutely delicious "secondi." Some of us had grilled T bone veal steak and others grilled homemade sausage, and of course we traded so everybody got to taste everything. There were vegetables as well, all of which were undistinguished except for the delicious fried potatoes. I sometimes think vegetables in Northern Italy are for the tourists as well. We have noticed the wait staff is always slightly surprised when we ask about Verdura. As our Italian friends mother once told us, "We ate enough vegetables during the war." In all the whole meal went perfectly with the 2 liters of local, light, bubbly red wine. To be honest I can't even remember the desserts, but I see from the bill that there were 3 of them and my best guess is that I did not have one. Fortunately, we only had to walk upstairs and fall into bed.